Miley Cyrus at Panera Bread, 501 Wilshire Blvd, Santa Monica. Even celebraties have to eat, right? 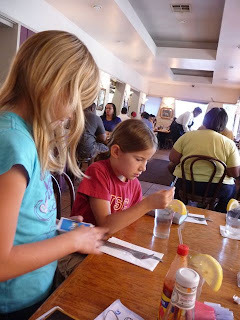 Our last summer living in Los Angeles was back in 2010. My kids - ages 8 and 10 at the time - told me "hey dad, we saw Miley Cyrus at lunch." Did they take a photo? 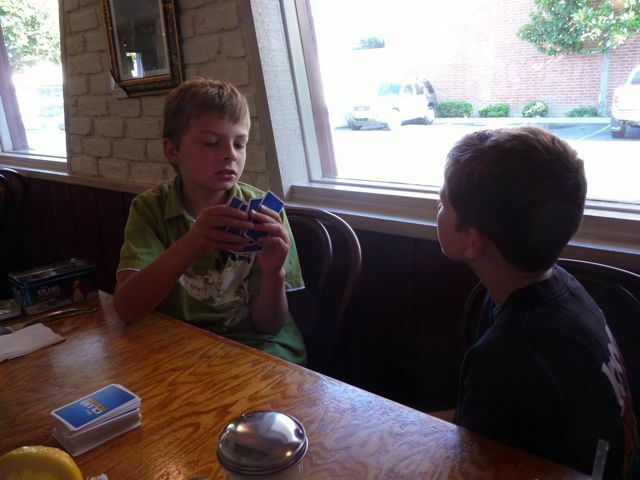 Fortunately, a friend was there with my kids at the same time and snapped a photo. Most people in Los Angeles try to give celebrities space; it's considered very bad form to bother them. 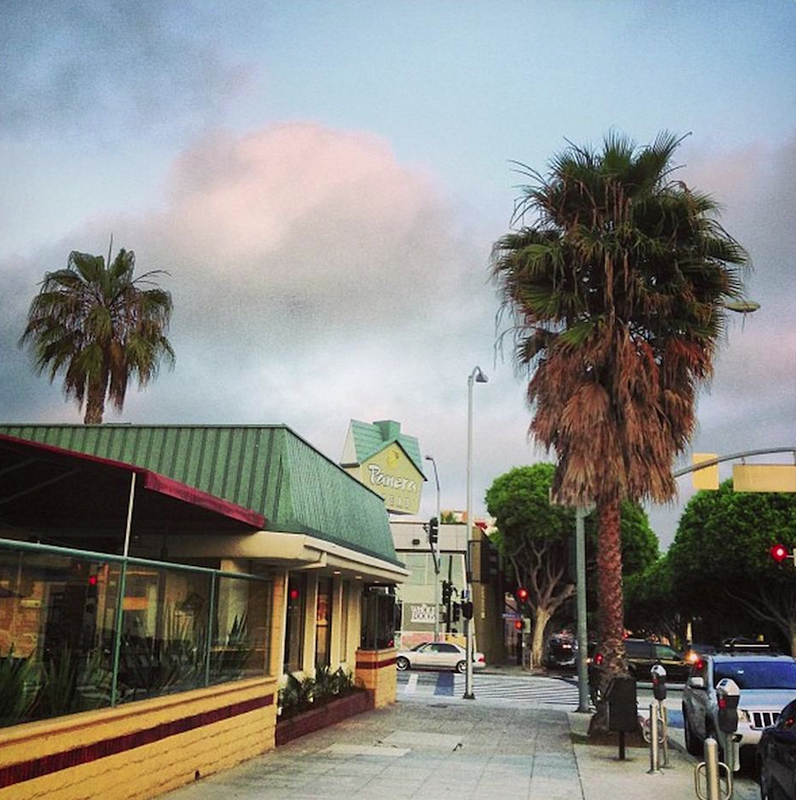 Hopefully, taking one photo - and then posting it on line - of a celebrity out and about in L.A. isn't too paparatzi. If you're just visiting Los Angeles for a week or so, the chances of running into a celebrity are pretty rare (although it does happen). But people who live and work in L.A. eventually see them all the time. My mom worked at a bookstore in Westwood and waited on Michael Jackson. My dad was at the Jack-in-the-Box late one evening in Pacific Palisades and had a conversation with Madonna. A friend from our church working a couple blocks from Panera interacted with dozens of celebrities at the Apple Store where he worked. In the case of Miley Cyrus (at Panera, pictured above) I honeslty don't watch enough TV to have recognized her (sorry, Disney Channel). Of course, my kids immediately knew who she was (thanks, Disney Channel). As a Christian, I often wonder what does it mean to live out your faith in a city like Los Angeles? Here's a few thoughts from a previous post. I'll come back and try and write something more if I get more time. I'll close for now with a family photo taken that same summer: Wilshire Blvd, a couple blocks from Panera. 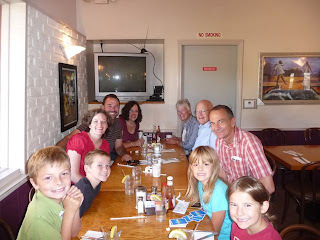 In February 2011 we were back in L.A. to say goodbye to my in-laws, living in the "Bungalow Heaven" neighborhood of Pasadena at the time. Time to stop off at Roscoe's House of Chicken and Waffles. 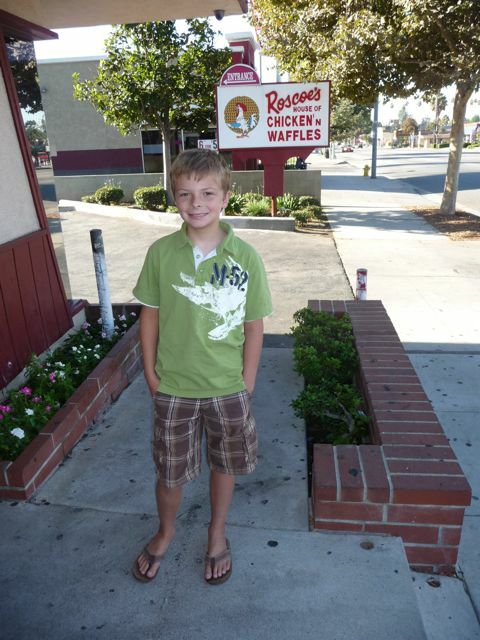 Above, my son - age 11 at the time - out front. While a place like Roscoe's is not unique to Los Angeles (you'll find them all over the US, especially in the Southeast), maybe what is unique is wearing shorts and sandals in February. Nice. 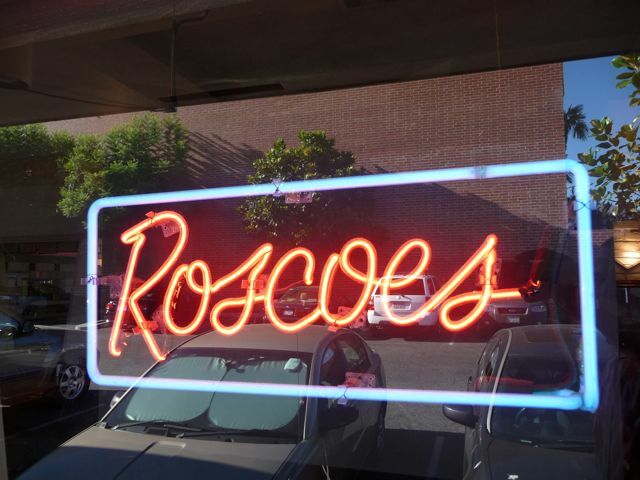 Roscoe's in Pasadena is located at 830 North Lake Avenue. 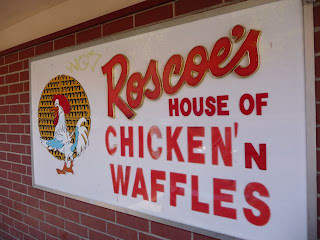 Roscoe's House of Chicken and Waffles is a Long Beach, California-based soul food restaurant chain founded by Herb Hudson, a Harlem native, in 1975. 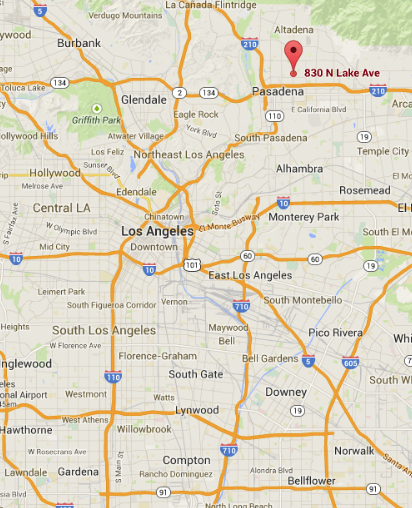 They have locations in Long Beach, Hollywood, Pasadena, Inglewood, and two in the City of Los Angeles. Love the bit of graffiti on the sign (barely visible). 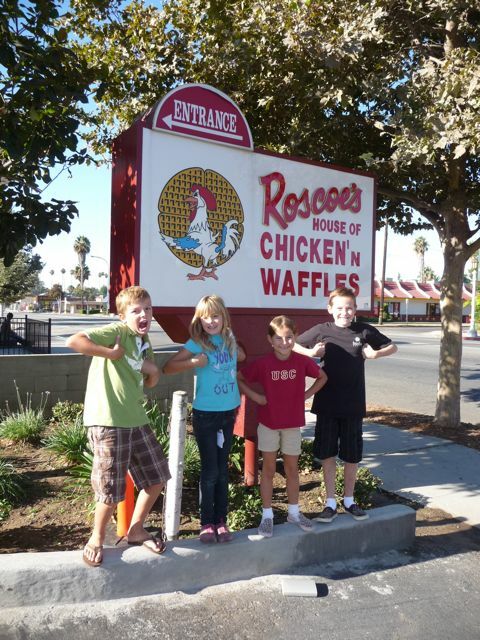 Just says "L.A."
My son, his sister, and two of their cousins. Good times, but sad saying goodbye. My brother-in-law, sister-in-law, and their kids relocated to Shanghai, China. This was one of our last times together before the big move. My son and his cousin playing cards while waiting for our food. If you're looking for health food, keep looking. Like the name implies, Roscoe's specializes in Chicken and Waffles. My daughter and her cousin playing some sort of game. 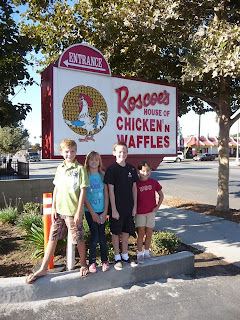 We loved living so close to family the five years we lived in Los Angeles. 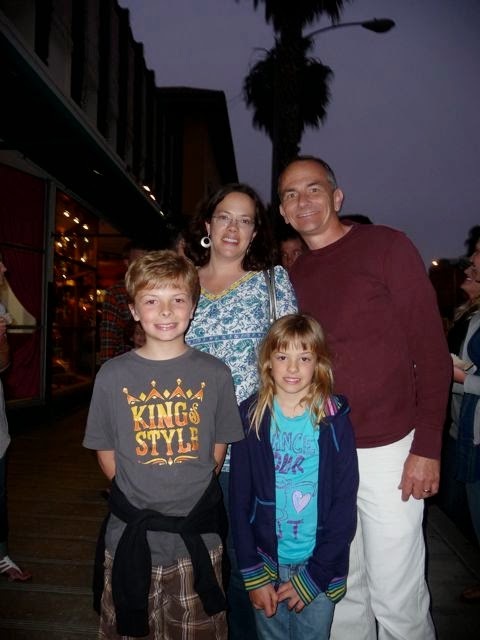 Lots of great times together, including trips to the beach, the California Science Center, the Autry National Center, and the Los Angeles County Natural History Museum, and the Santa Monica Pier. Click on any of the links for more photos and information. A final cousin photo. Fortunately, my in-laws have been back a couple times for visits - and we even had a chance to visit them in Shanghai. Here's a link to Roscoe's website.